The debate in Israeli civil society is if “institutionaliz[ing] a religion is going to disempower the members of the other faiths” (Bisharat 2010). As there are no official statistics or academic research about Arab/Jewish intermarriage in Israel, my fieldwork for my Master of Applied Anthropology study was a unique opportunity to collect information and relate with people who experienced this type of relationship. One of the few studies citing the phenomenon of mixed marriages between Arabs and Jews was conducted by the Tel Aviv Geocartography Institute. 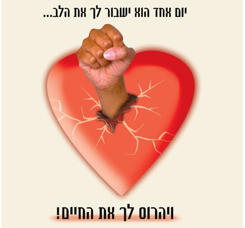 The results found that over half the Jewish population in Israel believes that the marriage of a Jewish woman to an Arab man is equal to “national treason” (Nahmias 2007). As the Palestinian – Israeli journalist Sayed Kashua expressed in one of his editorials: “Simply by being an Arab who carries an Israeli citizenship, one is accused of being a traitor. The accusation comes from both Jews and Arabs” (Kashua in Hochberg 2010). Such descriptions were also expressed by my informants, showing the extent to which the apparently personal act of marriage is widely regarded by both Israelis and Palestinians as being highly politically charged. The perceived danger posed by intermarriage constitutes the framework within which the main research question of my thesis was formulated. The main problem being debated in Israeli civil society is whether civil marriages, by increasing inter-faith marriages and inter-ethnic marriages, would divide the character of the Jewish State, as stated in the Declaration of Establishment of the State of Israel. My thesis aimed to demonstrate that the maintenance of the state’s Jewishness, which is defined in the constitution, provides a strong basis for the control of social boundaries within Israeli society. The maintenance of these boundaries provides the framework into which intermarriages are regulated and openly discouraged. Therefore an ideal endogamy is regulated and maintained by the state itself. Describing the situation of the “Arab minority” in Israel, Abu-Saad (2006) correctly underlines that Palestinians in Israel are considered as “outsiders” and an illegitimate presence in the Jewish-Israeli state. Palestinian citizens of Israel hold an Israeli passport that states their ethnic group as “Arab” (older passports also stated the holder’s religion). Since the Oslo Agreement the status of Israeli-Palestinians, who comprise 20% of the overall population (Central Bureau of Statistics, Israel, CBS, 2010), has been addressed as an “internal issue”. They are referred to as the “Arab minority in Israel” (Khalil 2007:36). The division between ethnic identity (Palestinian) and citizenship (Israeli) is clearly expressed through anti-assimilation policies, discriminatory practices in every-day life and urban segregation. For this reason, the “issue” of the Israeli “Arab minority” is pivotal for constructive and practical improvements in the development and long-term stability of the country. Although all citizens are allowed the freedom of practicing their own religion, the government maintains control over the authorities who can provide certain religious services (i.e. marriage, divorce) and imposes certain limitations (i.e. a prohibition against inter-faith marriages) (Abu-Saab 2006:1087). Nevertheless, it should be clarified that intermarriage is not “prohibited”, as it is not illegal under Israeli law. The state of Israel only officially recognizes “religious unions” and makes no provision for the registration of civil marriages – and therefore secular marriages – within Israel. However, civil marriages entered into abroad are recognized. In short, limitations on inter-faith marriage do exist, but legislative provisions do not forbid inter-faith marriage or consider it illegal in Israeli law. Rather, a “cultural ban” on Arab/Jew intermarriage is enforced and perpetuated throughout Israeli society via anti-assimilation organizations that coercively discourage relationships with “the Arab minority”. Furthermore, this cultural ban is highly gendered, focusing almost exclusively on averting relationships and marriages between Israeli-Jewish women and Palestinian-Israeli men. the affair begins as superficial love which appears to be authentic. Many times the girl doesn’t even know she’s going with someone who is a minority. […] The [Jewish] girls, in their innocence, hook up with Bedouin Arabs who exploit them. She sleeps with the enemy without realizing it (Silverstein 2008). Translation: (Top) One day he will break your heart. (Bottom) Your life will be ruined. this [anti-assimilation] department deals with women and teenage girls who have become involved with Arab men. In most cases, these relationships lead to marriage, which then deteriorate into violence. Among the many serious problems that result from such relationships is the identity of the children. They are Jews, but are raised as Arabs. Thus, entire generations are being lost to the Jewish people (Yad l’Achim, 2010). like they warn you to be careful while driving or when they warn you to be careful when swimming in the sea and there’s a black flag and a red flag–when it’s allowed and when it’s forbidden–the same thing we’re doing to warn girls of this unnatural phenomenon (Silverstein 2008). The politically charged importance of mixed relationships was clearly expressed by a chief rabbi from the area: “seducing” Jewish girls was “another form of war in the larger Israeli-Arab conflict” (Cook 2009). According to Yad l’Achim’s website, the organization receives more than 100 calls a month about Jewish women living with Arab men, both in Israel and the Occupied Palestinian Territories (OPT) (Cook 2009). Yad l’Achim carries out “rescue operations” in cooperation with the Israeli army, the internal security forces and the police (i.e. see the documented rescue operation: “Mother, Eight Children rescued from Muslim quarter”, Yad l’Achim 2008). Recently, more invasive practices have been created: vigilante patrol groups roam Pisgat Ze’ev, a Jewish settlement outside of East Jerusalem, every night. The group, linked to Yad l’Achim, patrols the streets looking for mixed Arab-Jewish couples (Cook 2009; Frenkel 2009). Other groups are also active in bigger cities, such as Beersheva and Haifa (Frenkel 2009). Similar “educational” programs are actively supported by other municipalities. For instance, at the beginning of 2010 in the South of Tel Aviv the municipality sanctioned a project between the municipality of Tel Aviv – Jaffa, the Ministry of Social Affairs and Ministry of Immigrant Absorption (which pays 75% of it). The purpose of the program, which involves 120 girls up to 22 years of age, is to “prevent relationships between Jewish girls and minorities” (Reider 2010). Clearly the government publicly supports its anti-assimilation policies and the efforts of the organization for “preserving Jewish values” and intermarriages are actively discouraged because they are portrayed as a strong symbol of assimilation and consequently an incorporation of / adaptation to the “other” group. they go out hunting for girls … we’re talking about local Arabs and Arabs from villages coming to Tel Aviv for work (Reider 2010, italics added). These girls are in distress. […] They feel that if they can’t defeat us in war, they can wipe us out this way. We must fight this threat as well; it’s a matter of national security (Yad l’Achim 2010). Marriage and divorce codes are crucial in the construction of identity boundaries, and regulate who does and who does not belong to the “imagined” community (Anderson, 1991; Yuval-Davis 1997:48-49). As declared by the Law of Return, citizenship is hereditary and the only conceivable way for an “outsider” to join the national collectivity is by intermarriage – conversion to Judaism does not give the automatic right to become an Israeli citizen – (ibid. : 27). Therefore, social endogamy regulated by religious and cultural codes are “crucial in constructing boundaries” (ibid. p. 49); as a result, some authors prefer to replace the term intermarriage with “out-marriage”, underlining the characteristic of “marriage outside of the group” (Bachi 1976:51 cited in Kanaaneh 2002:44, italics added). In this light, intermarriage has also being described as an act of “ex-patriation” (Tabili 2005:801), shifting from one homeland to another. Within this framework women bear the responsibility of a Jewish collective identity (Yuval-Davis 1997:45). Women play a key role in the biological and cultural reproduction of collective Jewishness through customary and religious laws of matrilineality (ibid. : 26-27). State-controlled sexuality assures the preservation of ethnic boundaries and quasi-cultural eugenicist control of marriages and, consequently, of births. The fact that miscegenation (unfortunate term from the Latin: “to mix + kind” or “to mingle + race”) and intermarriage are controlled by state legislation and discouraged by religious propaganda demonstrates that women’s sexuality is controlled and young women are being taught the “appropriate behaviour” [staying away from Arab men], while “exerting control” and supervision “over other women who might be constructed as deviants” [social cases], reporting them to specific authorities, or contacting the organization itself (ibid. : 37). In the case of the Jewish Israeli state, women’s major role in the “making of the nation” is amplified by the biological and cultural reproduction of its Jewish citizens. Israeli women carry the “burden of representation” because they are constructed as “bearers of the [Jewish-Israeli] collectivity’s identity” and citizenship (ibid. : 45). In an interview issued for Hadarim, Mahmud Darwish, the leading Palestinian poet, stated that: “it is impossible to ignore the place of the Israeli in my identity […] Israelis have changed the Palestinians and vice versa. The Israelis are not the same as they were when they came, and the Palestinians are not the same people either. Each dwells inside the other […] The other is a responsibility and a test […] Will a third emerge out of the two? This is the test” (Darwish, cited in Brenner 2001:91, italics added). As my MA thesis aimed to show, intermarriage is one of the “tests” Israeli society is facing and will continue to face in view of cultural/social pluralistic attainments. The cultural opposition and segregation that intermarried couples are facing demonstrates the resistance to a new formulation of Palestinian/Israeli identity. Arabs/Jews intermarried couples have a very important role to play in the formulation of a “third identity”, and in the development of a sustainable cultural change, creating an increasingly pluralistic society. In light of such difficulties, the formulation of a “third” mixed identity may be a first step towards a more pluralistic Israeli society (ibid.). This solution will involve the abandonment of nationalistic agendas (Palestinian and Jewish-Israeli) and the reformulation of social norms within Israeli society. Is it OK for Jewish-Israeli girls to marry Right-wing Germans/Italians etc? Jaap, is this a repost or an original contribution by M. Drago? If you are now interested in Israeli/Palestinian issues, you might want to meet Shifra Kisch and Erella Grassiani during your next visit to Amsterdam (unless of course you already know them). I am married to a half arab man and we still have a hard time with the families my mom does not talk to me for 11 years allready and my father denies that im his daughter his father is aiming to kidnap my kids and destroy our lives and our marriage we signed up for assylum here in USA and they are asking me to give them some articles that are similer to our case does any body know where I can get them?Thank you ill appreciate any addvise peace to all of us!!! I am a non-Sabra, Israeli Jewish woman. I am currently involved with an Arab man who’s entire family was born in Jerusalem and Ramallah. He himself was born in Jerusalem yet he is not an Israeli citizen. I was born and raised outside of Israel..yet I am an Israeli citizen. I am a citizen, simply because I am a Jew. There is something fundamentally wrong with this. Whats even more disgusting is that consenting adults are being deliberately targeted for simply being in love or wanting to be together…their only crime is that one is Jewish and the other is Arab. I for one do not believe that my country is an apartheid state, but when our religious and political leaders actively support initiates that criminalize (even if only on a de-facto basis) inter-ethnic/religious marriages or relationships, I am sorry but we are looking more and more like a racist apartheid regime. The Jewish people don’t need the help of religious zealots to survive. We’ve survived for thousands of years…most of which in exile! Among non-jews! If we truly believe in G-d then, who are we to tell people that loving another human being is wrong…or even unacceptable! I have thought long and hard about this man that I am involved with. What if we were to get married? What if we were to have children? It saddens me to say that every time these questions arise, the only viable answer is that leave Israel and move somewhere else in the world where people are more evolved…where our children could fully embrace both their Jewish and Arab/Muslim Identity. Where our children can be proud to have ancestral ties to both sides. I welcome anyone who feels differently to tell me why. I don’t have a problem with it. Israel can’t have it both ways. For Michali and Jan, I wish you success in your relationships. I Love my jewish girlfriend Sheina and we are getting married as soon as we move on from israel/palestine, I will be losing everything i have (family, job, house) but i will be winning her the rest of my life. good luck Michali, Jan, everybody else who have the same issue..
Do your research. Sincere converts who have lived in a Jewish community in the diaspora are eligible to make aliyah under the law of return. I think the operative word in the above quote is “automatic”. In your example you’ve cited a number of conditions. Could you provide evidence to the effect that all converts to Judaism are automatically eligible for Israeli citizenship? Otherwise, I believe the original point stands. I like your post. Jewish ladies are honest and faithful, this is right. I have to admit that Jewish girls are the most beautiful girls on this planet. Their mind is perfect. Most of them are beautiful in the heart and they believe in God. I like their attitude about relationship and marriage. Jewish women consider marriage as a lifeterm commitment. They select the best man to marry with. So, getting married with a Jewish girl is like a dream for every guy.